Giving a perfect gift either requires a heavy hint from the recipient or a flash of divine inspiration. Sadly, it’s not as easy as it should be and, more often than not, we receive something we don’t need nor like. Of course this is because most of us already own everything that we know that we want and the bigger ticket items are out of friends and family price-range. So bearing all this in mind, and when a book from Amazon (my default gift) just won’t do, I looked for helping-gift-hands. My first stop was the Gift Library, founded by the ex-personal stylist Caroline Stanbury. Her site offers pretty niche gifts for your men, women, children and home. It’s a joy to window-shop but, I’m sure Caroline would agree, the gift solutions are luxurious and high end so cater mostly for those less price sensitive. 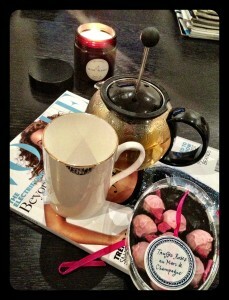 Rococco chocolates and a pot of camomile tea with my Liptease bone china mug for my night in. alone. bliss. And then I was introduced to product designer and art (branding) director Lucy Heale, who also happens to be the founder of Luxe Box London. The intro came via my great mates at Mason Photography; Luxe Box is part of StartUp Britain, a quite brilliant response from the private sector to the Government’s call for an “enterprise-led” recovery, and Mason Photography snap away for StartUp Britain on a regular basis. Lucy’s start up business idea interested me. And then when she sent me my very own Urban Goddess box of goodies, it interested me even further. Designed for the city girl to wind down at home, it arrived on an evening He was out and I simply couldn’t wait to get the Smalls into bed. In my box of treats I found: a box of Rococco Champagne Truffles, a Thorneback and Peel Notebook, a Wild Lavender Candle Jar and a Liptease Bone China Mug. Why do you think there is a need for Luxe Box London? Stylish women (and men) today want a gift box that offers something more, something exclusive, filled with stunning, seldom-seen products. How long ago did you launch your business? 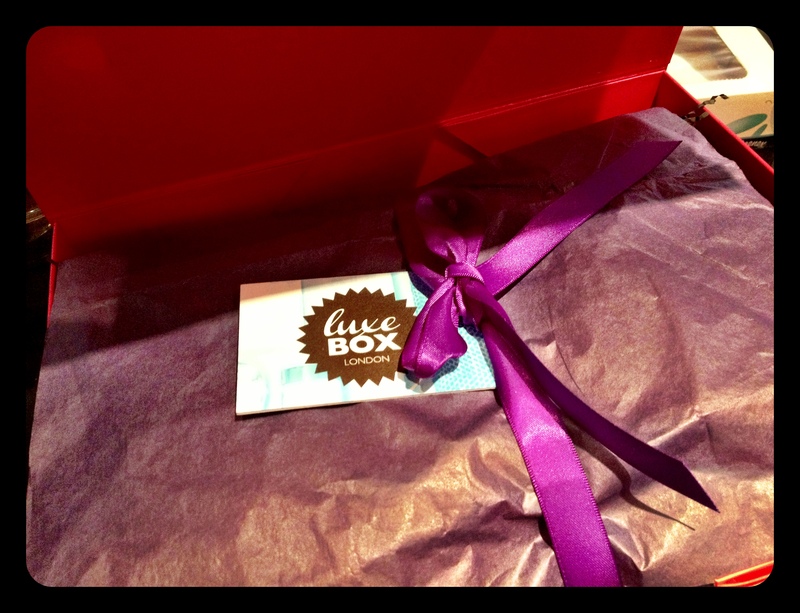 Luxe Box London launched just over year ago with the Urban Goddess Box and it’s been ‘all go’ ever since. I’ve put a lot of work into product development, and am set to launch additional boxes later this year including my Mum & Baby box and The Baker box. Where do you source the gifts? Everywhere and anywhere! I started by scouring shops and trade-shows in London, but now I’m approached by suppliers and new designers from within the UK. Once I’ve established a shortlist of my top 25 products, I look at the styling and how they work together as a gift-set. What’s the worst present you’ve ever been given? I have had a couple of pretty bad gifts but I’m not going to name any names! Who/what inspires you? 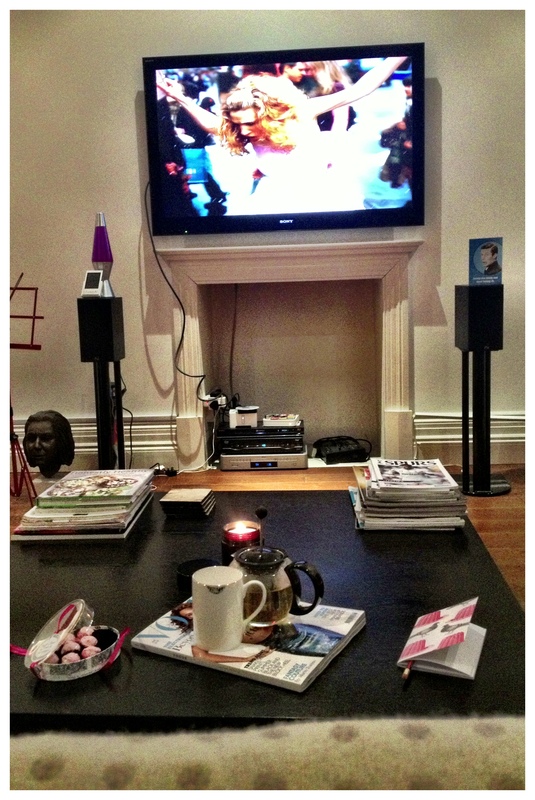 I love the idea of bringing incredible British designers together and showcasing them to consumers. I am inspired by walking around London, popping into new shops and talking to people about their ideas or businesses. Do you make bespoke boxes too? Each box is designed around a certain theme, but the sender is able to customise which products they would like to add in. Who would you LOVE to make a box for? Maybe I could design an extra special Mum & Baby box for Kate Middleton?! 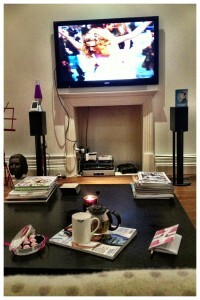 COMPETITION: Lucy has really kindly given me a Urban Goddess Luxe Box (worth £60) to give away to one very lucky reader. To enter, all you have to do is sign up to both my blog (top right of home page) and email your name and address to competitions@luxeboxlondon.com before Thursday 25th April. The lucky winner will be chosen randomly on Friday 26th April 2013. To check out Lucy’s Luxe Boxes, click here or, if you are are gifted at gifting, you can even tweet Lucy @lucyluxebox with your own ideas for boxes!